"Power, privilege, and wealth can buy everything but the truth." 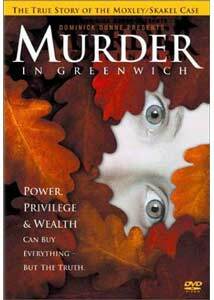 Murder in Greenwich will have you believe that Martha Moxley's death on October 30th, 1975, was an event that rocked the nation�a pretty young girl in an affluent neighborhood, beaten to death with a golf club, and the only suspect a troubled teen with ties to the Kennedys. The crime was never solved and no one was charged until beleaguered former Los Angeles detective Mark Fuhrman took over the investigation over 25 years later. Screenwriter Dave Erickson based his teleplay for this TV movie on Fuhrman's book of the same name, but he spices it up with some narrative tricks that are intended to inspire pathos for poor Martha Moxley. The dead girl (Maggie Grace) narrates the story of her life directly to the camera, speaking wistfully in the past tense à la The Lovely Bones. Her flashbacks are intercut with Fuhrman's (Law & Order: Special Victim's Unit's Christopher Meloni) story as he picks up where the police left off decades before. The central murder mystery is a total bore. It's obvious who was responsible from the get-go, and the script makes no effort to create dramatic suspense. Instead, a lot of time is spent establishing Moxley as some sort of symbol for American innocence, but her narration is so heavy-handed, it is impossible to think of her as a real victim (though such banalities as "I had an epiphany. I love that word, epiphany. It sounds like icicles breaking," certainly sound like the faux-poetry of a head-in-the-clouds teenaged girl). The real problem here is Fuhrman. There is some question as to whether he is investing the case as a way of clearing his name after the O.J. debacle, and throughout the film, he is outcast, resolute and hardworking despite the dirty looks and the rudeness from everyone he meets. I haven't read Fuhrman's book, so I don't know how much of his pariah/martyr-for-Martha story comes from the true-life telling, but onscreen, it all seems a little ridiculous (particularly the scene in which a Greenwich teen repeatedly badgers the former detective, asking him to say the N-word). The cast is decent, though all involved seem a little bored, particularly Robert Forster as the detective who first investigated the case in the '70s, and the production values are strictly made for TV. Tom McLoughlin directs the '70s flashbacks with bright sunlight, slow-motion, heavy filters, and all the subtlety of a Tampax commercial. The story isn't particularly compelling�yet one more file for the "Kennedy Curse" archives�and the tele-film has the feel of a sub-par episode of Meloni's weekly series. Image Transfer Review: This transfer, presented in the 1.33:1 ratio of the original television airing (don't be confused by the "modified to fit your screen" label on the back of the box), is fairly good, but it suffers from a few distracting problems. Colors are saturated, perhaps overly so�I'm not sure if it was a stylistic choice, but many scenes look rather fuzzy and suffer from some color bleeding. Fleshtones tend to look reddish and unnatural. Many scenes show some grain, particularly the darker ones (though black level is generally good). I noticed some slight aliasing in shorts, but nothing significant. Audio Transfer Review: This is an adequate audio mix that suits an undemanding film. Dialogue is anchored in the center, though there is a bit of bleeding into the front mains, and sounds clear throughout. Effects and music make good use of the front soundstage, and the score is mixed somewhat weakly into the surrounds. Fine, considering this is a TV movie. Extras Review: No extras are included for this TV movie, but you do get trailers for the biopic Auto Focus, and the thrillers Eye See You and Taboo. Murder in Greenwich is admirable for attempting to inject a human element into a police procedural, but the film falters with a script that is cloying and melodramatic, and a visual style that continuously distracts from the material. Columbia TriStar's DVD offers a fine presentation of this routine made-for-TV movie.